This beautiful book is one to be read in a single sitting. To read it is to totally submerge yourself in a complete world, in the blissful investigation of other people's problems. Gaelle, a beauty editor, flees her troubles at home and finds herself at Siesta Park, Western Australia. Here she meets Selena, an inquisitive thirteen year old girl whose friendship will force Gaelle to admit to the truths she hasn't been telling the world, and herself. 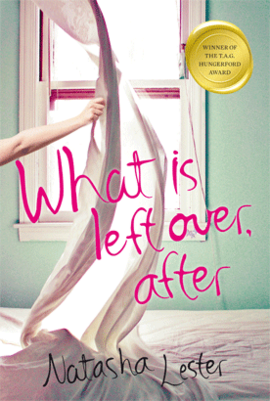 It is no wonder that Natasha Lester's What is Left Over, After won the TAG Hungerford award in 2010. The novel is simple but deep; it describes a slice of human experience at once foreign and relatable. The story is hard to define, spanning several genres including Literary, without any of the pretentiousness that this usually is accompanied by- no small accomplishment! At it's heart, the story is a celebration of storytelling, and the ways that humans use narratives to make sense of what happens to them. Weaving in elements of the classic fairytale helps to lighten the mood of an otherwise bleak life-story. I cannot review this book in depth, because I think to do so would be to ruin it for you, but I do recommend it whole heartedly so please do track down a copy.